At the tender age of 11, in the summer of 1970, Judy Pancoast first heard the lovely, inimitable voice of Karen Carpenter on the radio. Thus began an obsession with the music of The Carpenters, the best-selling brother-sister musical act of the 70's, that has lasted until this day. Judy listened to the Carpenters' records practically non-stop during her pre-teen and teen years, often locking herself in her room and singing along with a hairbrush for a microphone, imagining she was part of the band. She went on to become a professional singer, songwriter and recording artist herself, and, inevitably, some of that Carpenters sound made its way into her own music. To this day it is not uncommon for her fans to liken her voice to that of Karen Carpenter, until one day, out of the blue, someone said, "We're all waiting for you to do a Carpenters tribute concert. Have you ever thought about doing that?" But Judy didn't want to present the type of tribute concert that was an imitation or impersonation; instead, she wanted to sing the music that had shaped her life, and share the stories of her relationship to that music, and to The Carpenters themselves. Out of that desire came a unique cabaret concert presentation that not only respects the music, but draws the audience in to an intimate experience with Judy herself. "All My Best Memories: Built by The Carpenters" takes the audience into Judy's life as she recounts the stories of growing up a Carpenters fan and sings the songs closest to her heart. The show premiered at world-renowned cabaret club "Don't Tell Mama" in New York City to rave reviews from audience members, and has been invited back twice. Judy and her Musical Director, Michael Pierce, are available to bring this concert to intimate venues in the northeast. 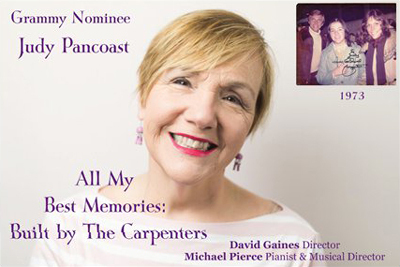 "Judy Pancoast's velvety voice, phrasing and conversational delivery of a song are all products of years spent listening to the timeless recordings of the Carpenters. Her passion and joy for the material make Judy the perfect vocalist to pay tribute." Randy Schmidt, author of "Little Girl Blue: The Life of Karen Carpenter"